The livestream is already going in Day 1, but the team is looking for more people that wish to contribute to a good cause. The #Spawn4Good: No Voter Left Behind fundraising event, hosted by the Spawn On Me podcast, is going down this weekend. The podcast crew and additional participants will be streaming on Twitch and donating the funds raised to the VoteRiders nonprofit organization, which helps people get the valid ID needed to vote in upcoming midterms and beyond. The crew is live now, but still looking for additional volunteers for the event. We are reaching out to all facets of the gaming community. Industry veterans, press members, new and established content creators/streamers + everyone in-between. We want a wide swath of folks who care about this issue to rock with us. If you choose to participate, it’s okay to talk about your personal politics during this event. The only thing we ask of you is that when mentioning VoteRiders on your stream is that you mention that they are a non-partisan organization and that your views do not reflect those of VoteRiders. Additionally, it is important to emphasize that VoteRiders is a group that provides IDs, but is not a voter registration group. Think of them as a “Step 0.5” toward voter registration in many states. 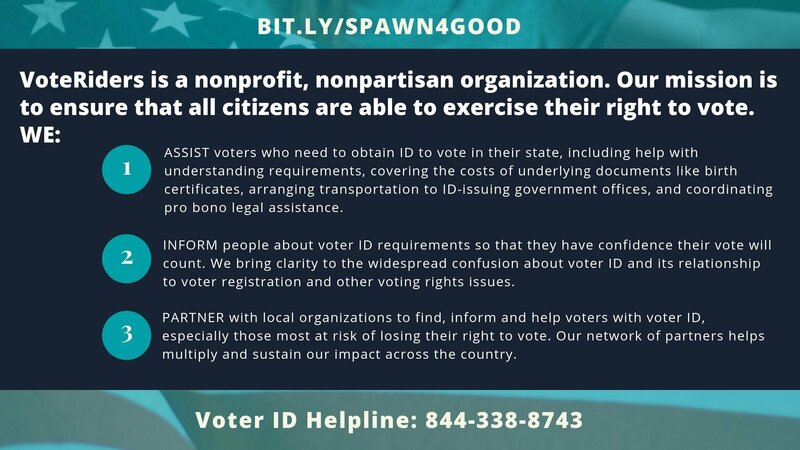 If you want to study up on states with voter ID laws ahead of the stream, please let us know and we’ll get supporting materials from VoteRiders. Again, you don't have to run your streams any differently than you already do. We want you to be your authentic, amazing selves while doing this. During #Spawn4Good events, we usually take a break at the top of the hour to share information via assets the org has given us to better educate the audience about who we are raising funds for. The event is currently going down, but the team is still looking for awesome humans that would be willing to stream for an hour or two during the weekend to help raise funds. Sterling McGarvey and Kahlief Adams are the points of contact if you'd like to participate. If you can't but have someone else in mind, please feel free to shoot them the information in this post.